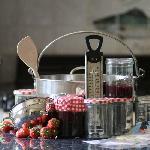 After I have made Jam/Jelly with my blackcurrants, I usually find a few more” hidden away” and make this. 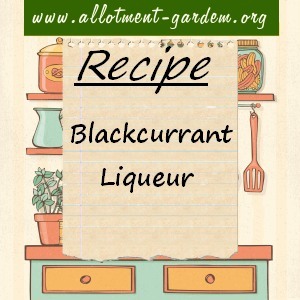 Into a clean jam jar (or a tad bigger if you have it) put a good large handful of dry blackcurrants (topped and tailed). Now let it cool for 10 minutes or so (you don’t want to crack the glass jar!!) and pour over the blackcurrants. Top up the jar with any alcohol you have in the cupboard, ie Brandy, Whisky, Gin, Vodka, White rum etc etc. (I have used mead (given to us) Ouzo (from Greece) even Sherry if I had nothing else!!!). NOW TASTE . If it needs more sugar spoon more in and shake every now and then and after a few more weeks try it again . If it is good, strain through muslin and funnel it into a bottle. Label (I put start date & bottle date on). Tuck it away for a special occasion and/or add a drop over ice-cream (adults only). It only gets better the longer you leave it !! I have some over 5 years old and it is delicious!!! Just a thought re any fruit with stones in, or seeds , I simmer the fruit until soft, then pour through a nylon seive ( not metal) rub the fruit with a wooden spoon & pour back into preserving pan to continue the recipe, Ifirst did this with my blackcurrants, as folk said they loved my jam but had problems with seeds in their teeth. I now have that ” problem so do this with most of the jam I make. 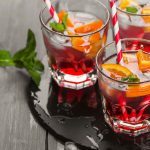 Plum & cherry , it makes life easier ( & I am all for that!!) ( do this BEFORE you add the sugar.